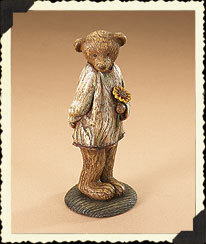 Boyds Bears Life Times Collection, Introduced in Spring 2007 -- Just Because...is inspired by those cherished moments that stumble upon us just by chance. The pure simplicity of his expression and del..
Boyds Bears Life Times Collection, Introduced in Spring 2007 -- Just Because...is inspired by those cherished moments that stumble upon us just by chance. The pure simplicity of his expression and delicately-detailed flower brings to life a sentiment that is sure to capture your heart. Underneath this 6.25" tall Life Times figurine you'll find a stylized symbol reflective of the emotion behind the piece, while a distinctive wood-grain finish and dangling folk-art style heart complete each and every piece in the collection.